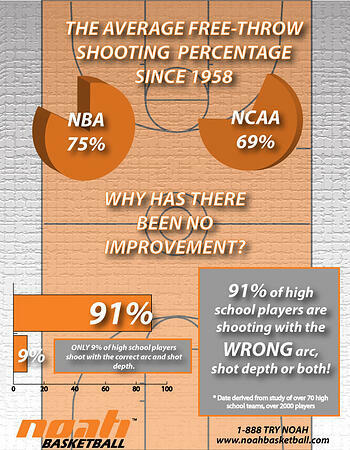 Basketball shooting percentages have been flat or decreasing at all levels of competition. For example, the National Basketball Association average free throw shooting percentage has been constant at about 75 percent since 1958, while field goal percentage has declined. The NCAA average free throw shooting percentage has been constant at roughly 69 percent. Even though we don’t have statistics for all high schools throughout the country, we believe it to be between 55-60 percent. Why do so many teams struggle with this basic, unguarded shot and why has there been no improvement? We just recently completed an analysis of over 70 high school basketball teams (boys and girls players) that included over 2,000 players. We did onsite basketball shooting clinics at each of these schools and tested all their players on the Noah System. If you would like to review some of these sessions, many of them are available on our Facebook page. After reviewing all the data, the problem with high school free throw and 3-point shooting is even more glaring than we expected. Only 1 out of 11 (9 percent) high school basketball players are shooting the correct arc (entry angle) and correct shot depth (distance past the front of the rim). A player will never reach full potential as a shooter until this is addressed and he/she are shooting at the optimal arc and depth. I will be presenting this analysis in more detail in future blog posts so be sure to subscribe to The Arc for future posts! Feel free to reach out to us if you have any questions or would like to get our thoughts on a particular topic.